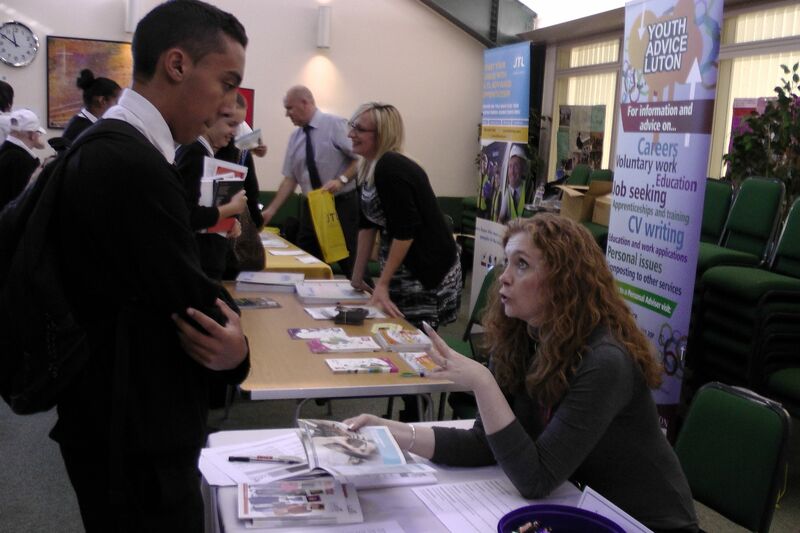 Last week we held our third annual Year 11 Careers Fair. 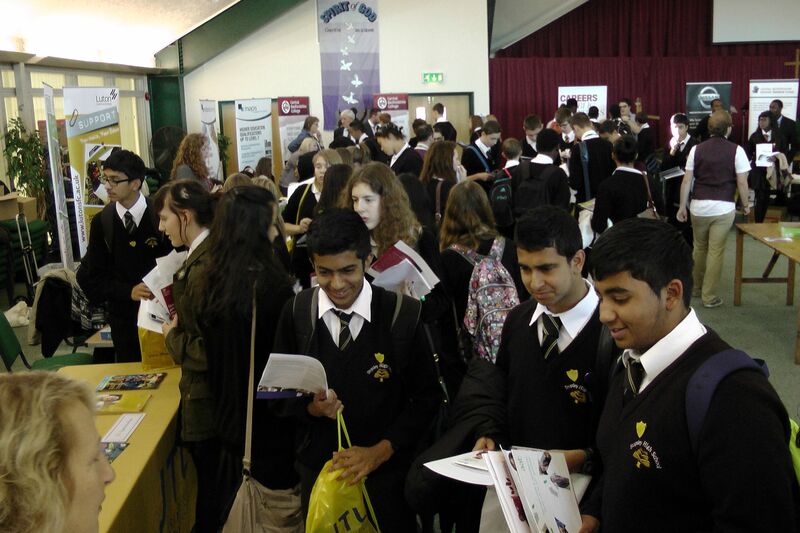 It is an all day event we organise jointly with two other local High Schools as we’ve found that this approach spreads the administrative burden in the build up but also tempts more exhibitors into coming as more students will attend. Promising to put around 500 fresh faces in front of them is much more of a draw than just one year group. Holding it in October seems to make sense as it ‘kick starts’ the reality of moving on for the Year group and, the closer through the academic year you get to exam season, the less likely you are to be allowed to take the students off timetable for an hour anyhow. To discourage the frantic “freebie collection dash” that Careers Fairs can sometimes turn into we prepare a questionnaire/evaluation for students to complete. This includes questions that they have to ask certain providers and space to reflect on any new information they discovered and how it affected their plans. For an after half term assembly we have some high street vouchers to give as prizes for the forms that have been filled in with the most considered answers, those which show the young person has really thought about what they heard on the day. We also ask the exhibitors to complete an evaluation and try our best to act on their comments (this year we moved the location in part because of last years comments), which are extremely helpful as we want to make it as easy as possible for all types of organisations to attend. Getting the right mix of Colleges, Sixth Forms, Universities, training providers, local and national employers to attend is the probably the highest hurdle to overcome. Some fantastic local employers such as Vauxhall, GKN Aerospace, Selex Galileo and Wates Construction attended alongside general employer bodies such as NAS, The Institute of Public Relations and Hit Training but we will always want more. Education providers are always keen to be there to market themselves and we thank and value their input as well. If you run similar events, I’d love to hear how you go about organising them and what steps you take to make sure the students wring out the greatest possible worth from them. Please get in touch via twitter or in the comments below. Following today’s release of the 16-19 Accountability & Assessment plans, I though I would add an update to this post. The plans make it clear that Destination Measures will be one of the Accountability measures used in the 16-19 performance tables. Concerns about the robustness of the data are mentioned again (page 10) but the document contains a clear commitment to improve the validity of these statistics and incorporate them into the range of measures used by the DfE, Ofsted and (it is hoped) students and parents to assess the quality of provision. With such a commitment to secure it seems, to my mind, only a matter of time before Destination Measures will be incorporated into the secondary performance suite. The Dfe recently published (October 2013) their long-awaited response to a consultation on changes to school accountability measures due to apply from the 2016 results season. There has been a deep and general consensus across education that the current headline figure of a pass percentage for 5A*-C at GCSE (or equivalents) is a blunt tool of measurement that encouraged schools to streamline their curriculum or overweigh it with equivalent qualifications, focus on the attainment of a narrow band of students at the C/D borderline and could be ‘gamed’ to such an extent that it did not accurately reflect a school’s performance. The reaction to the new proposals to include a Progress across 8 subjects measure, an Achievement across 8 subjects measure, the percentage passing English and Maths and the percentage passing the Ebacc suite of subjects has been extremely positive, even from those at the coal face of school leadership. There is a paragraph in the document though that should give CEIAG leads in school a moment’s pause. Only a few days later news broke that many Councils are failing in their duty to track 16-18 participation status, making it clear why the Dfe fears the current experimental statistics are not “robust” enough to be included as part of the headline suite of data about a school. The tortured tale of CEIAG in schools over recent months has finally reached a juncture in the story where Ofsted are offering judgement on a school’s attempts to meet their Statutory Duty as part of their regular inspections. The consistency and worth of these judgments will be determined in time but it is, at least, happening. Many in the CEIAG field are awaiting the publication of the further guidance promised after the critical Ofsted survey yet, perhaps it may be the inclusion (or not) of destination data in these new accountability measures that will have a greater impact on school leaders consideration of CEIAG in their planning. Guidance is, after all, only guidance and, if one thing is clear from this administration’s approach to education policy, it’s that the mantra of freedom rules. On each school’s website, we will make sure there is a ‘snapshot’ of their performance in a standard format, so parents can quickly understand a school’s effectiveness. The power this simple website addition will hold over Headteachers should not be under estimated: 5 clear figures, displayed on the front page of their school website, easily compared with other schools. Destination data has to be a one of those 5 figures for the progress we have seen to continue and for CEIAG to retain its growing importance in school leader’s minds. This rests on the actual data being collated and being “robust” enough to convince the Dfe of its worth. This is an area that those who attempt to influence CEIAG policy should be taking a keen interest in. Early Signs: Is Ofsted delivering the CEIAG judgement goods? A new term means new Ofsted inspections and reports which, this year, should get special scrutiny from the CEIAG community. For it is from this September that Sir Micheal Wilshaw has promised that a school’s proficiency in fulfilling the duties of the Statutory Guidance and the quality of their CEIAG work will be given a greater priority in inspections. The guidelines issued to inspectors are clear so now, for schools to believe that this work is a vital part of the structure they build for their students, it just has to happen. Specific mention of Careers/CEIAG/Destinations: On page 6, “They have also developed a range of courses which are increasingly relevant for students. Most students are now prepared well for the next stage of education or work,” which is really more about curriculum pathways and design rather than IAG. Specific mention of Careers/CEIAG/Destinations: None – although reference is made to qualification pathways and opportunities for small numbers of students to participate in work related learning but, again, this is a curriculum design issue, not an IAG reference. It’s far too early to form a judgement or look for any emerging patterns here on either how Ofsted are inspecting or then reporting CEIAG as part of regular school inspections but I wanted to flag up that, in some cases, it seems to be happening well. 1. 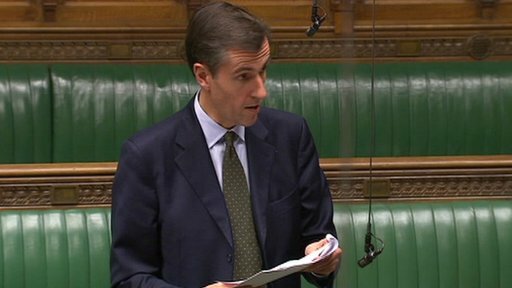 Will negative verdicts on a schools CEIAG provision start to appear as well? 2. Does omission of a CEIAG verdict in the report imply the inspection team did not focus on it or a negative verdict on the school’s provision? 3. Will Destination figures get a mention at some point? In time, we shall see.